New Racing Club Warwick manager Scott Easterlow on the sidelines while in charge at Stockton. Scott Easterlow says his priority as the new Racing Club Warwick manager is to persuade local talent to buy into the club’s renaissance. Easterlow was appointed on Tuesday after a successful three seasons at Stockton which saw them win promotion to the top flight of the Coventry Alliance and challenge for the title in their debut season. He joins a club on the up, with the caretaker-management duo of Luke Evans and Gregg Plumb having taken over from Michael Hayden and led the Townsend Meadow side to a top-six finish in Midland League Division One. With Evans wanting to step down to focus on the youth team and Plumb deemed too inexperienced to take the reins himself, Easterlow’s strong Warwick and Leamington connections were instrumental in him being given the nod following a lengthy recruitment process. 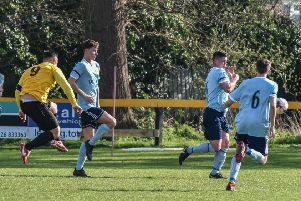 “I had a few offers in the last week or so for different football posts but as soon as I spoke to Racing I knew there was only one place I wanted to be next season if I could,” said Easterlow who turned out for Racing Club in a playing career which also took in Alveston, Leamington, Rugby Town, Coventry Copsewood and Kenilworth Town. “I live in Warwick myself so this is my local team and I want local lads to be playing here, flying the flag for our area. “I have believed for many years there’s a lot of local talent that choose to play elsewhere for various reasons. “It’s now my job to convince them Racing is the right club for them with big opportunities which they should grab with both hands. “The club has had their best season for a long time, finishing sixth which entitles them for entry to the FA Cup this coming season. So it’s a great time for me to get the job as the club is on the upturn. “But also, I know by my own standards we have to keep improving. “I want to build on what they did here last year, not just dismiss it and that includes keeping some of the current squad as there are some really good lads already at the club.